Home » Blog » Dead Or Just Sick? This blog post from Premier Dental Esthetics in Arcadia centers around the need for root canal treatment. Since our teeth don’t grow and the enamel is not made of living cells, sometimes we forget that teeth are alive. We are reminded that they have active nerves when we have a toothache or sudden sensitivity to hot or cold food. 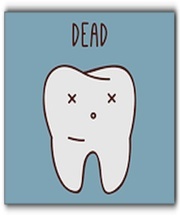 Like other organs, teeth need a blood supply to stay alive and healthy. When a tooth becomes infected, it can be saved with root canal therapy. During a root canal (known foramlly as endodontic treatment) the soft tissue in the root of the tooth is removed. Once the roots are cleaned out and widened, they are filled with a special rubber material. The root canal is only the first step in the complete tooth restoration. The final steps are the core build up and crown. In addition to root canals, Premier Dental Esthetics in Arcadia provides a full range of cosmetic dentistry services. Schedule an appointment with us today.